"In the language of Benjamin Franklin, you're a schlemiel." While the silent era is getting an ever-increasing selection of its surviving films released on DVD, the very early talkie era is represented by only a handful of titles. Kino attempts to remedy this lacuna in film history with this selection of comedy short subjects from the period 1929-1933. While the movies were still trying to find their voices, Paramount Pictures turned to the established stars of vaudeville for these comedies, and the resulting package is a marvelous peek at a period of theater poorly documented, combined with some of the slapstick of the silent period. 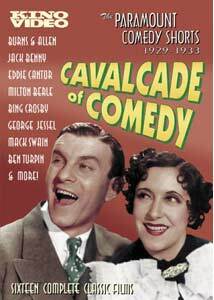 The 16 shorts on this DVD run from one to three reels in length, with some of them little more than a filmed version of a vaudeville sketch, while others are more fully developed essays in film comedy. The nifty part is that many of them feature stars well known today who were just getting their feet wet in movies. Starting off the disc is Fit to Be Tied (1930), starring Burns and Allen. A thinly designed tale, it features George trying to buy a necktie at a department store where he runs into clerk Gracie; at that point she does what she does best with her completely loopy comedy that's irresistible and delightful. She even sings a song with the classic line, "I've got galloping consumption, I eat and run." They break the fourth wall completely at the end, congratulating themselves on finishing their first talking picture. Getting a Ticket (1929), one of the earliest on the set, features Eddie Cantor doing some cute skits with the police, with another song. Cantor has a great persona that really comes across nicely in this film. More of his movies need to be released to DVD. Jack Benny is featured in A Broadway Romeo, acting as a scam artist very different from his radio personality, but it has a bit too much heart, and things get rather sappy by the end. The comedy duo of Smith and Dale (the inspirations for Neil Simon's The Sunshine Boys) display the ethnic comedy that was a staple of vaudeville in What Price Pants (1931). They take Jewish stereotypes and have fun with them, turning expectations on their heads so that what could easily have been nasty and anti-Semitic comes off as charming. A shockingly young George Jessel is featured in It Might Be Worse (1930), as he tries to convince his friend not to commit suicide. Bing Crosby croons away in Sing Bing Sing (1933), in which he tries to elope with a girl through the means of his radio show. It's a mess of a story, complete with a guy in a gorilla suit, but Bing's obviously having so much fun that one can't fault it much. Lulu McConnell is pretty well forgotten today, but in The Introduction of Mrs. Gibbs (1930), a one-set one-reeler, she makes the most of the talkie format, jabbering away as she gets increasingly obnoxious and drunk when she meets her daughter's in-laws-to-be. By the end she's way over the top and side-splitting, matching the stuffed-shirt-puncturing ferocity of Groucho Marx and then some. The gaunt and dour comic Tom Howard stars in the first of two pictures, The African Dodger (1930) as he unwillingly gets suckered into becoming a carnival act that has baseballs thrown at his head. It features a lot of snappy vaudeville patter in a limited and stagey setting that makes one suspect it's a direct transplant filmed in an hour or so. Mack Swain made his name as the mountainous foil for Charlie Chaplin but he gets top billing with Chester Conklin in the anarchic Cleaning Up (1930), a knockabout film featuring the pair as inept streetcleaners who accidentally find themselves on the police force, a plot structure that anticipates some of the films of the Three Stooges. Construction work would be a staple of the Stooges' work too, and three examples of such pictures are included here for comparison. The Plasterers (1929), starring O'Donnell and Blair features the stars as Italian workmen on a construction site. Nearly plot-free, it's utterly surreal: no attempt is made to hide the fact the buildings are cloth backdrops, and their horse is two guys in a suit. The picture culminates in an inspired ballet of clumsiness and mayhem with astonishing timing. It's a real gem of a movie, and one of the best on the disc. Plastered (1930) features "Willie West and McGinty," a little less stagey but certainly slap-happy look at construction. Finally, A Put-Up Job (1931) with Karl Dane and George K. Arthur, borrows the instant house story from Keaton's One Week and a few gags as well. But it has a freshness from the character work of Dane, an immense lunkhead, and Arthur, a prissy Englishman, giving them an amusing variant on the Laurel and Hardy set-up even as things move quite predictably. Lighthouse Love (1932) is a silly tale of four (or more) men in love with a woman (Dorothy Granger), featuring Franklin Pangborn, who usually served a supporting character. As a bonus, silent star Ben Turpin makes a brief and surprising appearance. Breaking Even stars Tom Howard again as he tries to take his friend George Shelton's mind off suicide; it's a very different version of the It Might Be Worse story, making them interesting variations on a macabre theme. In 100% Service (1931), Burns and Allen essentially remake Fit to Be Tied, but this time set in a hotel, with Gracie doing her thing as a cigarette girl. It's equally fun, though. The package is wrapped up with the longest film, Milton Berle's three-reel comedy, Poppin' the Cork (1933), a college comedy about the repeal of Prohibition as Elmer Brown (Berle) tries to marry the daughter of the dean. Berle's character is also quite different from his TV persona of several decades later, much more leering and somewhat sleazy. It makes for a good finale, showing how far the medium had come in just four years. Image Transfer Review: Most of the films are presented in full frame, often (but not always) windowboxed to varying degrees. It Might Be Worse inexplicably varies in aspect ratio from 4:3 to 3:3, depending on the particular shot. The films are in pretty good condition overall, and they have plenty of detail and reasonably good clarity. Artifacting is minimal, aside from the occasional episode of ringing. What Price Pants starts off in fairly rough shape, with tears and speckles, but eventually improves substantially. Nothing's unwatchable, though. Audio Transfer Review: Early talkie sound is pretty unreliable, and these cheaply made films are no exception. There's plenty of hiss, rumble and noise. Some of the shorts have a nasty vibrating sound to them. The shorts with musical numbers sound quite nice, since they were likely taken from better source materials than live miking in the first place. Once you account for the era, they sound fine, but don't expect either range or natural sound reproduction. Extras Review: There are no extras beyond a handy "Play All" button or the option to play an individual short subject. An invaluable and hilarious look at early talkie comedy, with some nice transfers but little in the way of extra materials. The Burns and Allen films and the O'Donnell and Blair picture are worth the price of the DVD all by themselves, but there's plenty more laughter here.